More complex polyhedral shapes are accessible this week, with up to 38 faces, building on the skills developed over the last couple of installments. Our first subject is this quince, a big, blocky, firm fruit. It suggests a solid, blocky-looking polyhedron, such as the rhombicuboctahedron. But for an extra twist (literally) we will carve a pseudorhombicuboctahedron, taking us out of the Archimedean into the Johnson solids. The approach to carving this polyhedron is to use the fact that its projection in all three orthogonal directions is a regular octagon. In other words, we can start by carving an octahedral prism as tall as it is wide, and then carve the pseudorhombicuboctahedron (PRCO for short) out of that. Moreover, every octagonal projection has a square face centered within it. So the proper template that you need is this square in an octagon — you can download it, and print it out at varying scales until you find one that fits the dimensions of your fruit well. Make the first flat cut and judge which size to use by the resulting cross section, remembering that your finished sculpture will be exactly as high as it is wide. Note that in this case it is OK if the corners of the template extend slightly past the actual cut cross section at the top and bottom, so long as the bulk of the fruit extends past the boundaries of the template, since the PRCO is in effect chamfered and so the material near the corner will be cut away anyway. In any case, taking these considerations into account, you can begin by cutting an octagonal prism as high as it is wide. Next make sure you have the square-in-octagon templates lined up on the two octagonal ends, with the squares rotated 45 degrees from each other (that’s what puts the pseudo- in pseduorhombicuboctahedron; if you align them, you will get simply a rhombicuboctahedron). Mark the vertices of the squares, and then use additional square-in-octagon templates to mark the vertices of the squares in the middle of each of the tall rectangular faces. Now it’s time to start cutting the remaining faces of the PRCO. It’s easiest to begin with the plane of one of the slanted square faces connecting the top face and one of the side square faces, because this plane meets the adjacent tall rectangular edge of the prism in a diagonal that runs from a top vertex of the prism (that will ultimately be cut away) down to one of the eventual polyhedron vertices on the side of the prism, as shown. Then cut along that line and the line joining two vertices of the top square. As usual, once you have that first cut, it’s easy to make all of the slices around the top by successively drawing actual edges of the eventual polyhedron, and then using those as guidelines for slicing. When you’ve finished the top round of slices, flip it over and exactly repeat the process on the other side, starting from the same first cut, until you’re down to one last slice. When you’ve finished that last slice, you’ve got your PRCO, shown here in an orientation that shows off the “pseudo”-ness: there’s a horizontal row of triangle-square-square faces, which can’t happen on an ordinary rhombicuboctahedron. Our next sculpture will be my personal favorite Archimedean solid, the snub cube. Since we haven’t yet carved an apple,and apple-carving was one of the inspirations for this whole enterprise, it seemed appropriate to use this particularly large Gala apple. As with the PRCO, we will use this orthogonal projection of the snub cube and the fact that it is inscribed in a regular cube to carve the snub cube. Begin by carving the apple into a cube (or near-cube, since again we don’t need the material in the very corners of the cube) with side length equal to the width of the projection (which you should print out six copies of, scaled to your apple). Then paper the sides of your apple with the six templates; they should touch each other at the edges. Mark the four vertices of a small inner square on each of the six sides. Important: note that there are two inner squares on the orthogonal projection. Make certain that you use the same orientation of inner square on each side. I used the one that slopes slightly up to the right at the top of the square. Using the other orientation on every side would lead to the non-superimposable mirror image of that snub cube (i.e. there are two mirror-image forms of the snub cube that are not equivalent in three dimensions). Using a mixture of orientations will lead to confusion and chaos (and hence difficulty in completing the carving). Once you have all of the corners of these squares marked, you’ve actually identified every vertex of the snub cube, in its actual final location in space. Hence, all that remains is to slice planes that connect three nearest neighbor vertices at a time. You can copy corresponding edges from the orthogonal projections onto the starting apple cube, and use those as guidelines for the initial cuts. But as with previous carvings, once you have done one slice, it will expose additional edges between vertices that you can simply draw in their proper position, and then use as guidelines for additional cuts. Every so often you will run out of faces that have an adjacent plane already sliced, and you will need to make another guideline projected onto material that will be cut away. As usual, you can see below what it looks like just before the last cut and when the snub cube is complete. 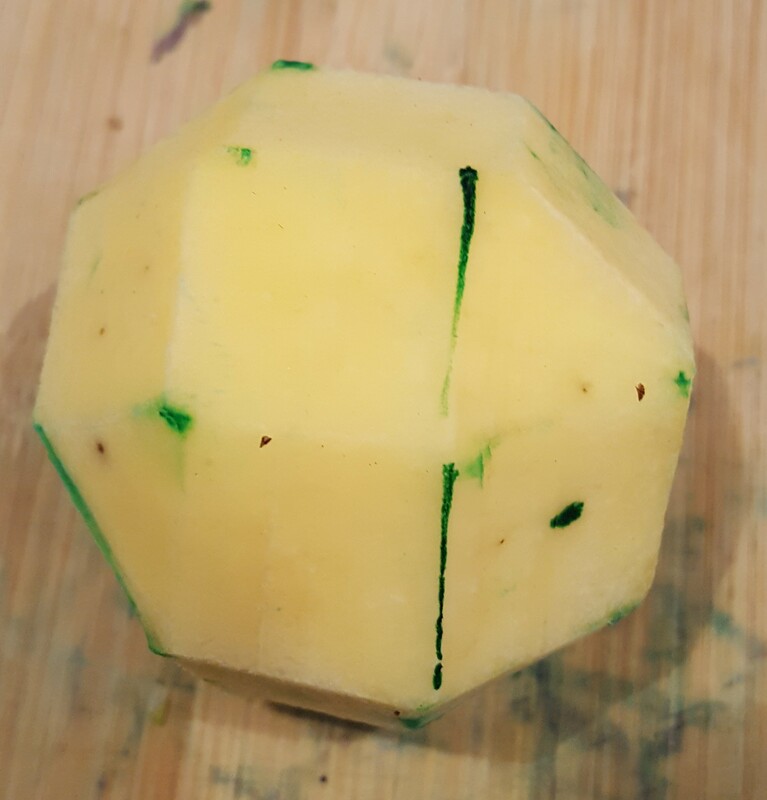 For the final polyhedral sculpture in the series, we are going to turn this almost perfectly spherical zucchini into a rhombic dodecahedron, which is not an Archimedean solid, but instead the dual of one, a so-called Catalan solid. For variety, it also adds a polyhedron whose faces are not regular polygons. The carving method is again based on its orthogonal projection; print out four copies sized to fit within your fruit or vegetable. You can make a prism of the projection shape, as high as the projection is wide. Mark the vertices on the top and bottom projections; and then the remaining vertices consist precisely of the midpoints of each of the vertical edges. If you draw in the edges that lie on the faces you’ve already carved (which consist of the four central rhombus edges on the top and bottom and the two central side faces) you will find that there are two non-parallel edges of every face of the final rhombic dodecahedron marked. So you have all the guidelines needed to complete your carving. With the techniques from this series on polyhedral carving, you should have the wherewithal to try lots of different polyhedra out there with species of your choice. When you create something lovely (and maybe tasty, too! ), share a photo with [email protected].